Lifestyle In Riverstone ~ Nature's pathways along bow river are just steps from your door Welcome to ZENs largest two-storey floorplan the "EMPIRE". Featuring a kitchen w/ convenient eating counter for relaxed gatherings, defined dining & living areas w/ space for an optional fireplace to make cool nights cozy. 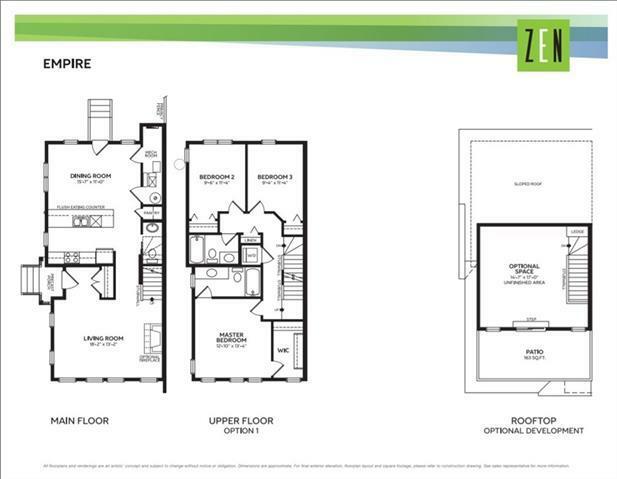 Upstairs offers stackable laundry facilities & 3 bdrm plan w/ the master including 4pc ensuite. In addition to a fenced yard the EMPIRE has a private rooftop patio! ZEN townhomes fit your budget by experiencing the benefits of sustainable living w/ utility bills that are lower than you expect. ZENs positive EnerGuide rating gives you an average of 36% energy usage savings every month. All this comes at no extra cost to you! Every Avalon home is third party EnerGuide rated, giving you the assurance of a guaranteed energy efficiency rating on your new home... Showing you exactly how energy efficient your home is. Enjoy convenience of nearby shopping, theaters, dining & more in Cranston & nearby.